Chinese Cucumber Salad is an easy cold side dish to prepare when company is coming. 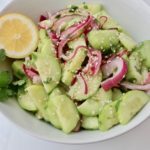 Our cucumber and onion salad recipe is a perfect appetizer as it takes only a few minutes to prepare. Once you’ve chopped the cucumbers and onions they simply marinate in a rice wine vinegar dressing. While your Asian pickled cucumbers rest in the fridge, the bold flavours of ginger, garlic and cilantro muddle and mellow together. 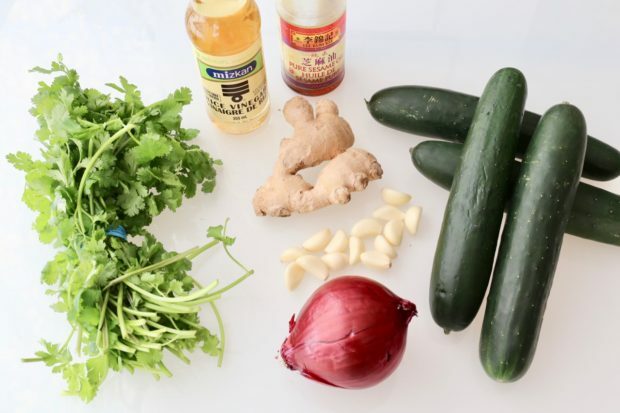 Easy Chinese Cucumber Salad ingredients. In Asian culinary traditions, a salad is often designed to provide a contrast or balance with other dishes. In Thailand for example, papaya and mango salads offer a crunchy and refreshing bite in between spoonfuls of spicy curry. The harmonious blending of textures, colours, and flavours are a hallmark of Chinese cuisine. Food historians have traced ancient Chinese culinary traditions by studying the immigration patterns of the Chinese diaspora. Bustling China Town’s in cities like Toronto, Markham, Vancouver, Yangon and Penang, have become famous places to enjoy a taste of traditional and localized Chinese recipes. Chinese Cucumber Salad recipes will vary depending on where in the world you are eating. The quality of sesame seed oil, variety and availability of red onion or cucumber and the local taste for spicy food will dictate how a cucumber ginger salad is served. You could easily spend a week exploring the Chinese restaurants in Taipei and Hong Kong, simply in search of the perfect Chinese pickled cucumber! 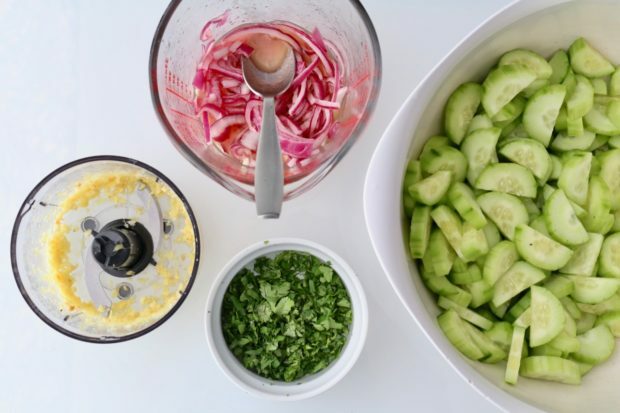 Our recipe for Easy Chinese Cucumber Salad requires a food processor, sharp knife and whisk. Some traditional Chinese Cucumber Salads arrive at the table smashed and then cut into diamond shaped pieces. Our easy cucumber salad simply requires you to peel your cucumbers and slice them into half moon shapes. I prefer the slicing method as I enjoy eating delicate slices of cucumber over large wedges. The crisp cucumber is then mixed with garlic, ginger, and cilantro, drizzled with vinegar and sugar and then finished with fragrant sesame oil. The sauce is light, yet offers a distinct sour flavour with a sliver of sweetness. Once you’ve mastered our Easy Chinese Cucumber Salad you’ll want to find a few main course dishes you can serve at the table as a compliment. Our cucumber and onion salad recipe goes well with pretty much any Chinese dish such as stir-fry, noodles, braised-meats, and deep fried treats like egg rolls. You can even serve cucumbers and onions in vinegar with Western cuisine. 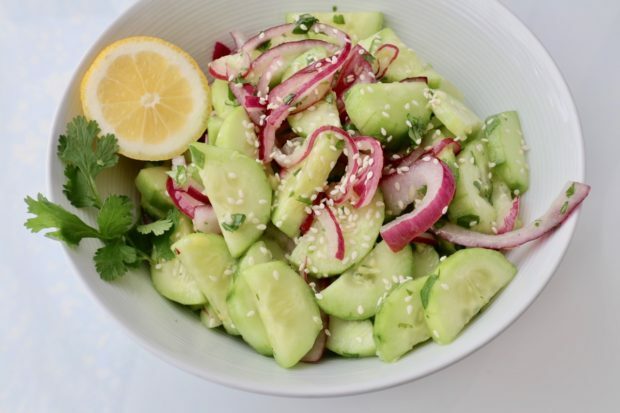 If you have any favourite dishes that you tend to serve with pickles, cocktail onions or gherkins you can easily substitute for our easy Chinese Cucumber Salad. I find dishes that are fatty or have a high carbohydrate content pair well with Asian pickled cucumbers as the acidity and crunch offer a perfect contrast. Try serving our easy Chinese Cucumber Salad with Tartiflette Reblochon, Pulled Pork Mac & Cheese, or Swiss Cheese Fondue. Our easy cucumber salad is flavoured with garlic, ginger and sesame. Seeing that China is such a massive country, it’s no shock that cucumber and onion recipes vary from region to region. Our easy cucumber salad is refreshing and crunchy but lacks a spicy kick. It’s a perfect cucumber and onion salad recipe for those who can’t handle heat. Many Chinese restaurants will serve Asian pickled cucumbers to satisfy locals who love spicy cuisine. If you can easily transform our recipe into a Spicy Chinese Cucumber Salad by adding chili oil, red pepper flakes or chopped fresh Thai chili peppers. Chinese Cucumber Salad is an easy side dish that takes just 5 minutes to make! Serve alongside stir-fry, noodles, braised-meats or spicy deep fried treats. To prepare the dressing, whisk together vinegar, sugar, canola and sesame oil in a medium bowl. Add sliced red onion, mix well and leave aside to marinate for at least an hour. Place the ginger, garlic and salt in a food processor and blitz. Use a spatula to scrape the ginger and garlic mixture into the onion dressing marinade. Stir together. Cut cucumbers lengthwise in half, then cut each half into 1/4 inch thick slices. Add the sliced cucumber to the bowl, followed by sesame and cilantro. Stir well and let rest in the fridge for 15 minutes before serving.